The InterNations Ambassadors in Brasilia on behalf of Her Majesty The Queen have the pleasure to you invite you for InterNations Tea (AKA whatever you want to drink☺). Our event this month will take place at the garden area of the beautiful The Queen’s Place (116 Sul) starting at 18:00. The venue will offer discounted prices on cocktails and bottles of sparkling wines. We will offer the venue's most popular drink, Summer Breeze, as a welcome drink! Come join us to meet fellow expats and global minds. 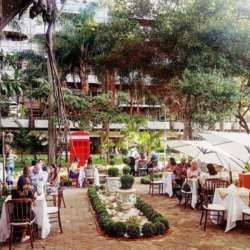 We will raffle a true Britsh Tea Experience right here in Brasilia to a lucky member.